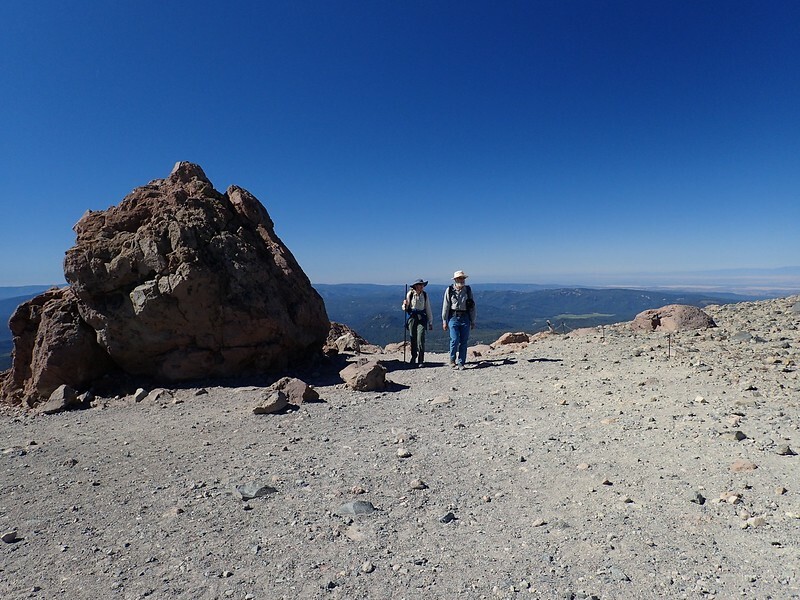 This is the first year in several years that the trail up to Lassen Peak is fully open all the time and so we made testing it out our morning activity. The trail is basically a well-graded ramp that takes you gradually but steadily upward. 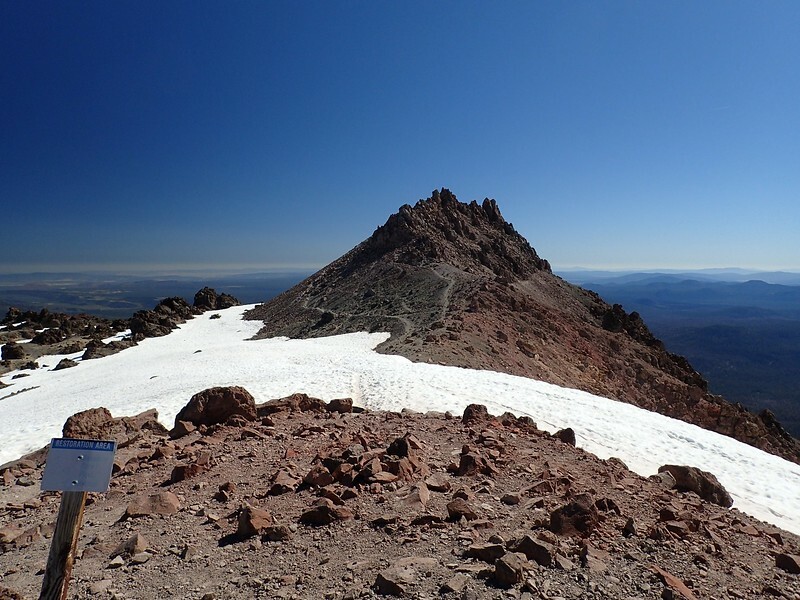 It looks easy but the starting elevation (8,500 feet) and the lack of shade can surprise folks who start up it in flip-flops with a half can of warm Pepsi. The weather was perfect (but got warmer and warmer as the week went on) and we had views everywhere. 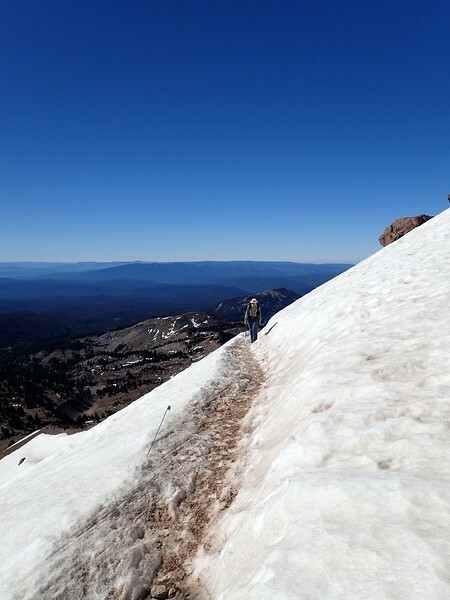 There was only one 100-foot long patch of snow left on the entire trail. 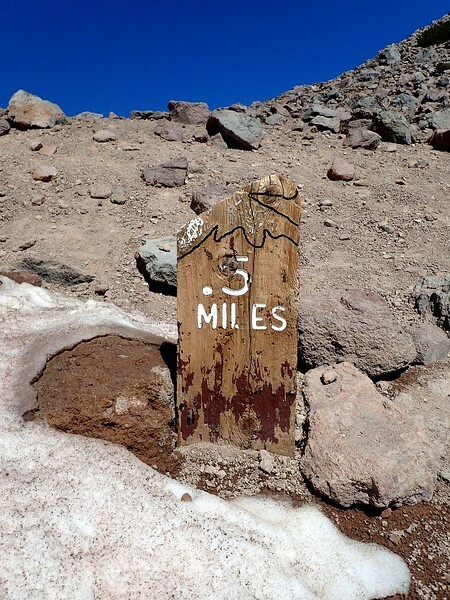 The last remaining historic “teaser” trail sign pops up shortly before the summit. but the actual summit is a rocky point further to the northeast. 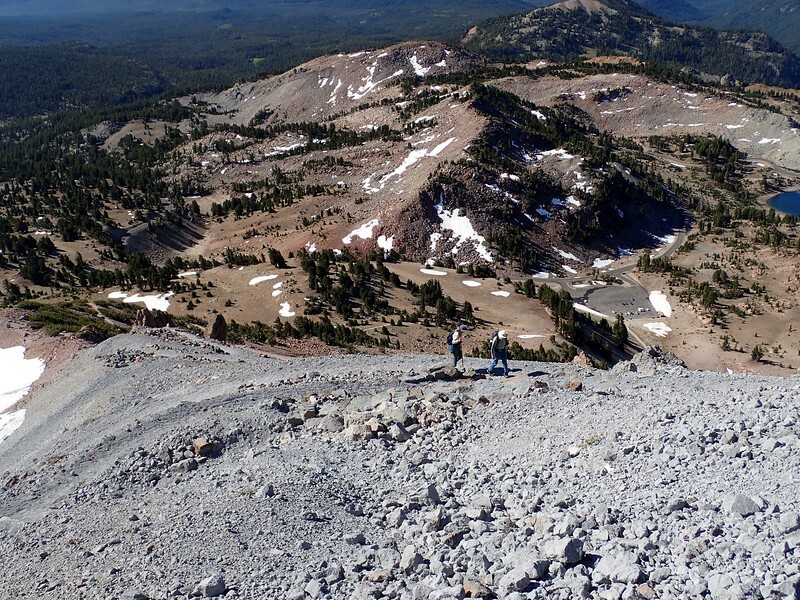 There are several use trails leading to it but I wonder how many people just call it a hike at the lower summit? 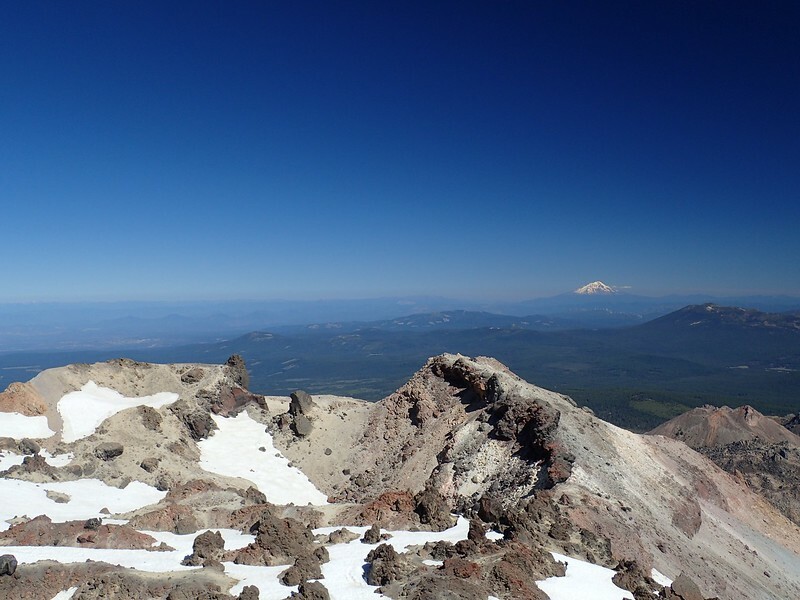 From the higher summit, we had a 360º view and could see Mount Shasta to the north (with the wind farm at its base), as well as smoke coming in from the Buckskin Fire in Southern Oregon. Later in the week a fire would start near Lake Tahoe and it too would send smoke into the Lassen area. 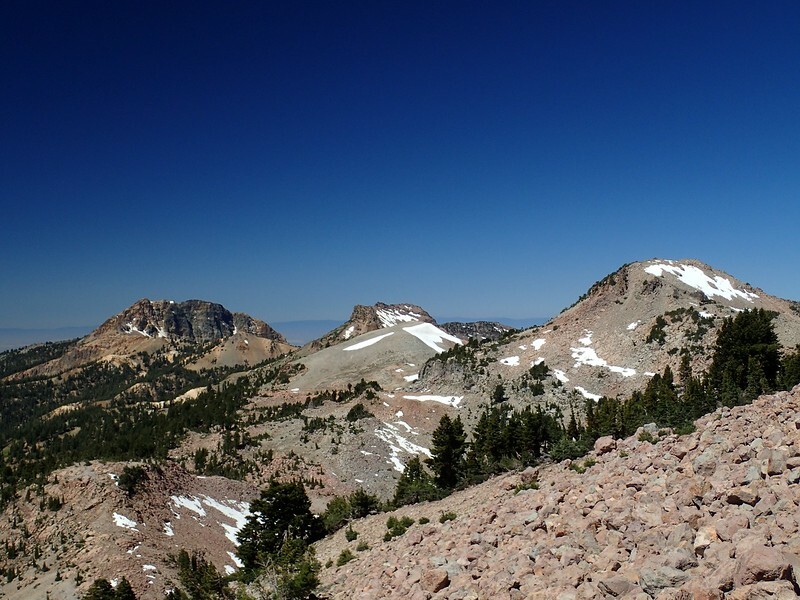 As we’ve noted before, you can see Mount Shasta from many places in Northern California but Lassen Peak is usually much harder to pick-out among the surrounding peaks and (often) smoke and haze. We’d gotten an “early” (8:00AM) start so we only encountered 5 people on the way up. 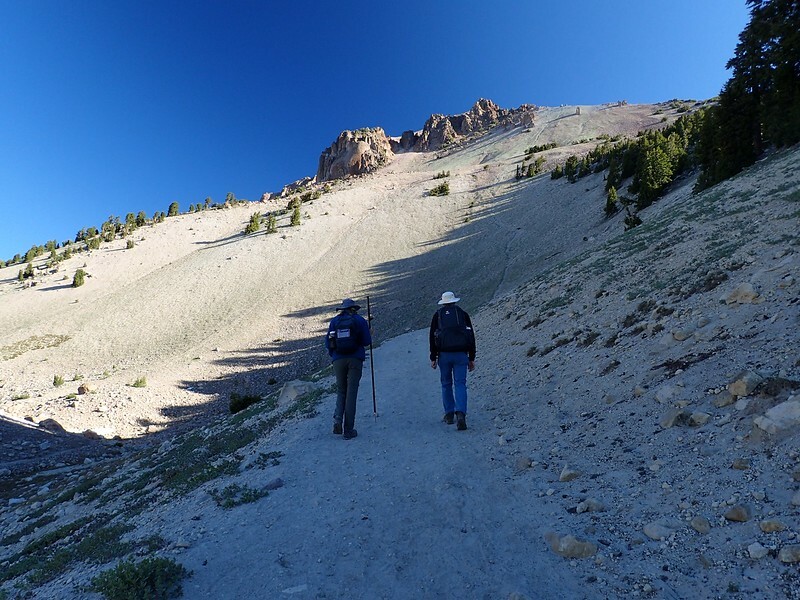 But coming down two hours later, we passed 60 folks on their way upThe rule with Lassen seems to be hike early to avoid the rush! And despite numerous Park Service signs about being ready for the outdoors, more than a few of these “hikers” seemingly had little or no gear (like water and sunscreen) to make their hike a little easier and safer!